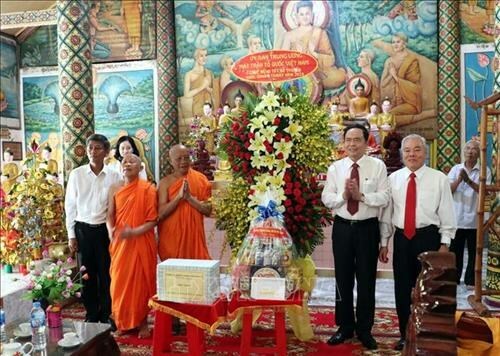 Soc Trang (VNA) – President of the Vietnam Fatherland Front Central Committee Tran Thanh Man visited religious dignitaries in the Mekong delta province of Soc Trang on April 5 on the occasion of the Khmer people’s Chol Chnam Thmay festival. At the meeting, Man expressed his hope that monks and nuns and other dignitaries play the key role in encouraging local Khmer people to follow Party guidelines and State law and policies along with preserving their cultural identity and improving their living conditions. He said the Khmer people have contributed greatly to upgrading pagodas in the locality and monks and nuns of Khmer Theravada Buddhism have actively participated in activities of the Buddhist Sangha of Vietnam. He said he believes that the dignitaries and the entire Khmer people in the province will do more for the national solidarity and development. The official was concerned about the poverty rate in Soc Trang as it accounted for 8.3 percent of the locality’s households and mainly focused on ethnic minorities, saying he expects authorities and socio-political organisations will pay attention to supporting the poor households in improving their livelihoods. The Khmer people account for 30.71 percent of Soc Trang’s population. The province has 130 places of worships, including 92 Khmer pagodas.